Team! I'm afraid I didn't have time today to put together a Q and A feature for today. I hope you'll forgive me! But I do have a new comic for you, of course! Man, I bet you would be really worried if you came here on an update day and that didn't happen. Come back on Monday for the next one! Patreon backers, current and aspiring: a new month's worth of rewards are now live! 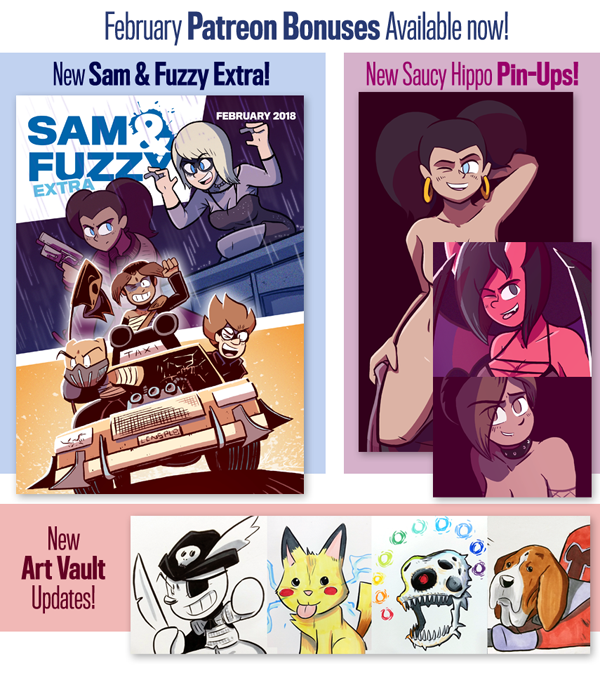 There's a new bonus art poll for everyone, a new issue of S&F Extra for Extra-level backers, and a ton of new marker illustrations for Art Vault backers. Thanks for another month of support, backers! I had a ton of fun making this month's bonus stuff, and I've got some fun couples-themed stuff planned for this, the corporate-mandated month of love. Come back on Wednesday for our next comic, y'all. See you then!